If anything touched by classic Star Wars is your weakness, you’ll want to buy these so bad it almost hurts. 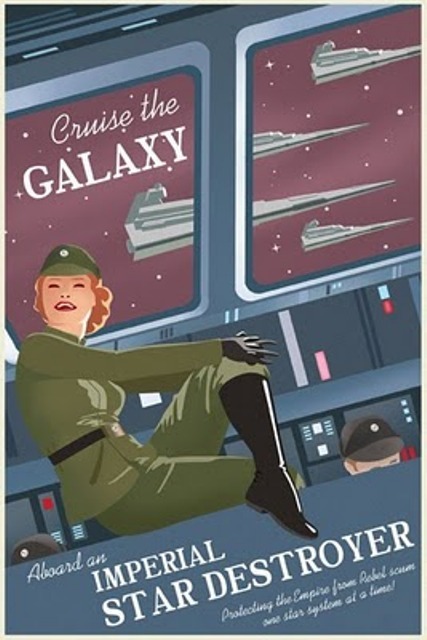 The picture you see above is among eight travel-themed promo posters of yore (say, the 20s and 30s) that have a Star Wars spin. Created by artist Steve Thomas for release and printing via a certain unnamed website that’s been delayed for two years. Thomas has finally decided to put them up them on his blog since there’s a book of Star Wars fan art due son and he doesn’t want his labors to go unnoticed, selfishly hidden from the public eye. There are a total of eight colorful illustrations that entice the viewer to visit a galaxy far, far away. Thomas has prepared a gallery of sorts in this location. If we had the dough or the pull to score a couple of these, we’d go for the one with a chick advertising Star Destroyers and the Rogue Squadron Airshow.